What's thin, waterproof, and bound to be available exclusively on T-Mobile in the States? 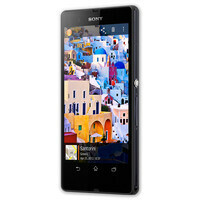 The Sony Xperia Z, of course, and it is coming to the nation's fourth largest carrier in just a few days. As T-Mobile just announced officially, the Sony Xperia Z is scheduled to launch on July 17. Those who are interested in getting the smartphone will be able to pre-order one online no later than July 16. To sweeten the deal, buyers will get a free pair of Sony wireless speakers as a gift (while supplies last). Price-wise, T-Mobile has the Sony Xperia Z priced at $99.99 down with 24 monthly payments of $20 each. That sums up to $579.99 total, plus the cost of your service, of course. Alternatively, the Sony Xperia Z will be on sale at the 38 Sony Store locations across the US, as well as on the company's US online store, priced at $579.99. The handset should be available at these stores today, July 10, bundled with a pair of Sony wireless speakers until stock is exhausted. If rumors are to be trusted, the Nokia Lumia 925 is also expected to launch via T-Mobile on that very same day - July 17. Pricing for Nokia's high-end model should be identical, with a $99.99 down payment followed by $20 paid monthly over the course of 2 years. Now I feel like moving too tmobile just for that phone. Might as well buy it unlocked. I'm waiting for the Z Ultra. Tmobile doing good getting phones. why do american carriers get phones so late ? my canadian carriers almost always get new phones on release if not they get them pretty soon. just like untill a couple months ago i think it was t mobile that didnt get the iphone 5 why is this ?